Welcome to a wonderful new cabin getaway in the Ozark Mountains of Missouri, overlooking the crystal clear Black River. 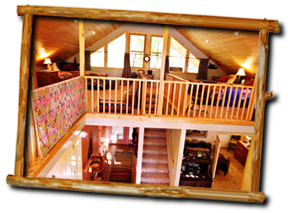 This beautiful cedar cabin comfortably sleeps 8 and features a wonderful view of the river valley below, from either the large outdoor deck or a bird’s eye vantage point in the spacious loft high above the river. 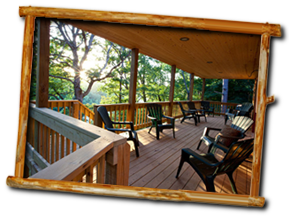 Just two hours from St. Louis, MO this beautiful cabin is the perfect getaway for you and your family, good friends or for a staff retreat. It is located on one of the most peaceful sections of the crystal clear Black River near Lesterville, Missouri, 50 minutes southwest of Farmington, MO. The cabin is just 20 minutes from Johnson Shut-Ins State Park and 35 minutes from Elephant Rocks State Park. Whether you’re looking for a relaxing extended vacation or just a weekend away, we invite you to our cabin. Call us now to make your reservation. 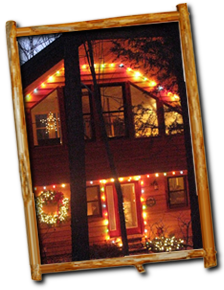 We know you will enjoy Sunset Ridge Cabin! Copyright © 2010 Sunset Ridge Cabin. All rights reserved. Web Design by Visual Lure.